Description: When Laurel Inwood features Italian cuisine on the Terminal at the Tracks menu, she knows she'll need to stock the shelves, the fridge, and the freezer with plenty of wonderful delicacies. She just never expected one of them to be her old boss, Hollywood superstar Meghan Cohan. 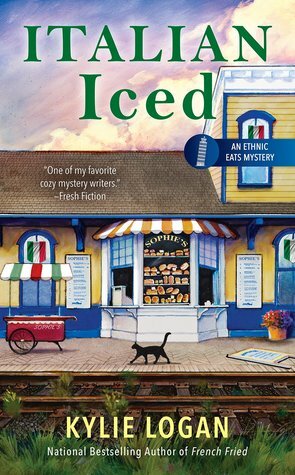 But one day when Laurel is at the restaurant early to get ready for the regular rush of customers, that's exactly what she finds--Meghan dead in the Terminal freezer. Why I Picked This Book: I actually own the first two books in this series but haven't read them so I was excited to get the opportunity to review this one. Plus, the concept is so fantastic! My Impression: Did I mention I love the concept of this book? I wish a restaurant that changed the cuisine around once a month actually existed. Thanks to all the foodie cozies I've read in the last few years my wishlist of restaurants/cafés/coffee shops/bakeries has exploded! I love mysteries that involve digging into pasts and in this time we're looking into Laurel's past and the victim's past which was an extra bit of fun. Just who was Meghan before she was famous and what was she looking for in Hubbard, Ohio? It was quite a ride finding out with a crazy cast of characters some sympathetic and some thoroughly dislikable. I was kept guessing until the end about just what had happened and who was the killer. Laurel does have quite the complicated back story but I really had no problem feeling invested in the story and with the characters. I think part of why it worked is that the roster of recurring characters is kept pretty small so while Laurel and Declan had some issues they were working through there weren't 15 other people with similar levels of dysfunction. I am looking forward to going back to the beginning and learning more about Laurel but it's more because I liked her character than because I was confused about anything. My only real issue was that occasionally the time line felt a little jumbled but more in a "wait - how many days has it been since she actually went home" vs a "wait - what's happening now" way so I didn't find this to be an issue. This was a fun super fast paced cozy with a likable main character and food descriptions that will have you craving pasta. I can't wait to find out what cuisine Laurel will be cooking next book! Would I Read More of this Series/Author? Absolutely! I'm glad I have the first two books and I'll be looking for the 4th in the series. Would I Recommend this Book? If you enjoy cozies this is a fun series and I loved the different cuisines spins! I had no trouble jumping in right here so I think you could pick up with whichever book appeals to you. Sounds like a fun book, & I love the cover. I used to live not far from Hubbard. Now that I'm writing the Ethnic Eats mysteries, it's amazing how many people I've met who either live in or near Hubbard! It does sound good and I'd read it if I were more into cozies. I think I'll make my way through the book series by Kate Carlisle and see where that leaves me... or not! Yes a restaurant that changed its menu frequently would be very good! This sounds like such a fun mystery! I love how the restaurant changes every month! I'm so glad you enjoyed this one. I loved this one. I read the second one, but not the first yet. Although I have the first on my Kindle. I pushed the other two ahead for reviews. It's such an interesting concept. Glad you liked it too. Sounds like a fun read and series! Kylie here (who is also Casey Daniels). 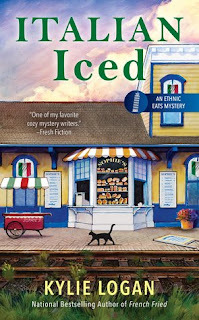 So glad you enjoyed "Italian Iced!"